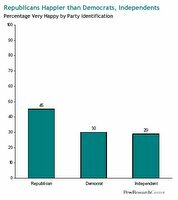 from livescience: Republicans are happier than Democrats. People who worship frequently are happier than those who don't. The rich are happier than the poor. Whites and Hispanics are happier than blacks. Married people are happier than the unmarried. plus: rfid tags!, insect cyborgs! & the big bang!